There are a few rests that I would recommend to people without hesitation and this is one of them. 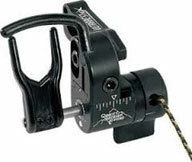 Quality archery design makes several different levels of rests which operate in a similar fashion. All Q.A.D. rests operate off of the downward moving cable of a bow. As a disclaimer QAD HDX does provide a cable clamp which eliminates the need for a bow press however I do believe that serving the cord to your down cable not only looks better it also functions better. This is a good point to also know your own limits as this may be a rest better suited for a qualified bow tech to install (Q.A.D. does include a video that shows you how do install there rests). Setting up a QAD HDX is similar to that of any other rest. Bow needs to be secured and leveled, then attaching the rest to the bow. Once this has been done, put the launcher in the upright position and set the nocking point so that it is level. Also, at this point, try to set the center shot (left and right adjustment) as close as you can eye ball it. Once the rest is in the correct position, you need to attach the drop cord to your bow’s downward cable. This can be done with the provided cable clamp or by serving the drop cord to your downward cable. In either case, it should be attached to your cable at about the same level as the bottom of your grip. The rest should be set so it reaches it fully cocked setting in the last few inches of the draw cycle. The Pros and Cons of the QAD HDX Drop away arrow rest. Here are the pros and cons of the QAD HDX arrow rest. For more information, visit the QAD HDX website.